The goal of the STEM Education Center is to assist preschool through college math and science teachers in meeting the needs of their students through professional development workshops, model lessons, and hands-on training. For more information on upcoming scheduled workshops, please visit ESC Works or contact one of our specialists. The STEM Education Center maintains a Resource Room of teaching materials, as well as a Library of professional journals and curricular books, for teacher use and check-out. Our Math and Science Specialist provide professional development in science, technology, engineering and mathematics content for Arkansas pre-service and certified teachers, as well as technology trainings for the UAFS faculty. This assistance is provided to individual teachers within their own classrooms, large-scale school faculty trainings, and multi-district trainings in the Institute's campus classrooms. 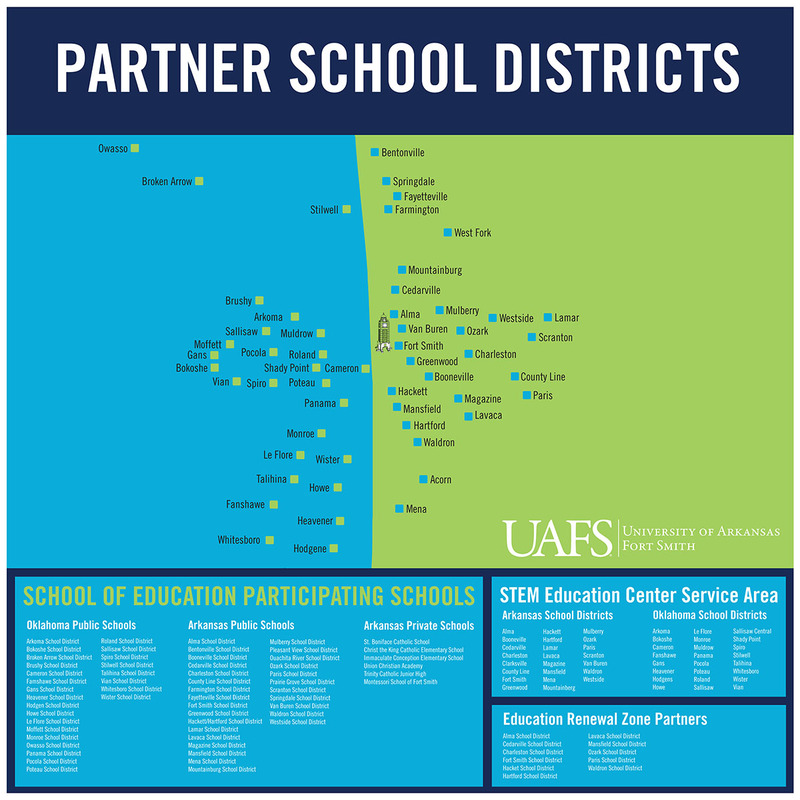 The service area of the STEM Education Center include over twenty of the Arkansas River Valley area school districts, including Alma, Booneville, Charleston, Cedarville, Clarksville, County Line, Fort Smith, Greenwood, Hackett, Hartford, Lamar, Lavaca, Magazine, Mansfield, Mountainburg, Mulberry, Mena, Ozark, Paris, Scranton, Van Buren, Waldron, and Westside. Due to the close proximity to Oklahoma, the STEM Education Center also provides its services to many of the local Oklahoma school districts. These include Arkoma, Bokoshe, Cameron, Fanshawe, Gans, Heavener, Hodgens, Howe, Leflore, Monroe, Muldrow, Panama, Pocola, Poteau, Roland, Sallisaw, Sallisaw Central, Shady Point, Spiro, Stilwell, Talihina, Vian, Whitesboro, and Wister.